What is White Whole Wheat Flour? Delicious. I was searching through old photos today and found these whole wheat blueberry muffins I made a while back. Since I remember them tasting just as delicious as they look, I decided that they shouldn’t be kept hidden on my hard drive any longer. The muffin recipe came from Elise at Simply Recipes and the only change I made was to use King Arthur’s White Whole Wheat Flour instead of all-purpose flour. If you haven’t started baking with white whole wheat flour yet, now is the time to start! The name “white whole wheat flour” might seem confusing since we are used to associating the term “white flour” with something that has had most of the nutrition processed and bleached right out of it. But white whole wheat flour is a whole grain flour that has been milled from hard white spring wheat, rather than traditional red wheat. It offers all the same nutritional benefits of traditional whole wheat, but has a milder flavor, lighter color, and finer grind, making it perfect for quick breads. I happen to really enjoy the flavor of traditional whole wheat flour and still use it for yeast breads, but I find myself turning to white whole wheat for things like cookies, quick breads, pancakes, pizza dough, and even pie crusts. It’s wonderful stuff! And if you’re new to baking with whole wheat flour, white whole wheat might make for an easier transition – especially if you’re baking for picky eaters! I haven’t tried any brands other than King Arthur Flour, but I know Trader Joe’s (who unfortunately stopped selling King Arthur) is now stocking their own brand of white whole wheat and Hodgson Mill is also producing a white whole wheat flour. I’m sure there are even more brands out there now. If you’d like to try experimenting with white whole wheat flour, I think a batch of muffins is a great place to start. You can use it in any recipe, just replace the all-purpose or traditional whole wheat flour with an equal part of white whole wheat flour. One thing to keep in mind: while white whole wheat flour does bake up a bit lighter than traditional whole wheat, it is still a whole grain flour and will not perform exactly like the processed all-purpose version. Your quick breads might not rise quite as high, and the crumb might be a bit more dense than in breads baked with all-purpose flour, but I really enjoy the flavor and texture of whole grain baked goods and think you will, too. 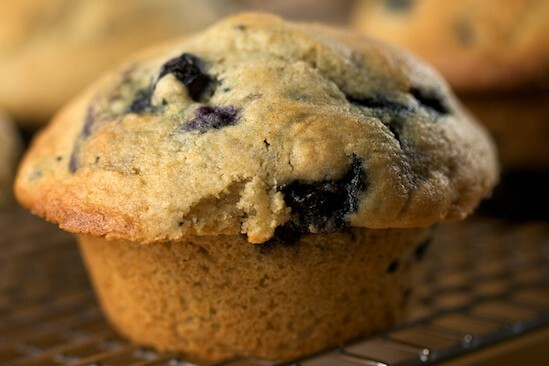 And really, who is going to say no to a blueberry muffin that looks like this? 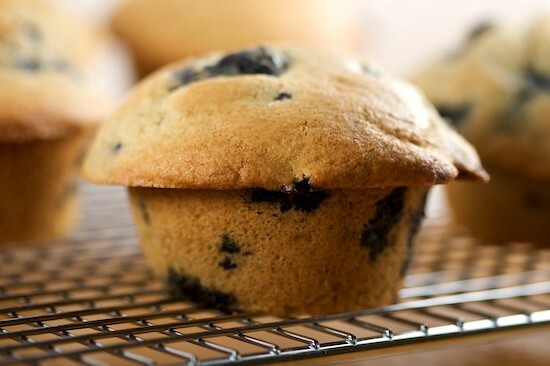 If you’d like to try these blueberry muffins, head over to Simply Recipes and print the recipe. Just don’t forget to use white whole wheat flour! These look wonderful. The photo with the butter especially gets to me! I need to give whole wheat white flour a try! I have never baked with white ww flour but you've got me convinced!! thanks for all the info & the muffins look great! Thanks for sharing this information. I am going to give it a try. Delicious looking muffins! Wow, white whole wheat flour sounds great! I've never tried using it before and am interested in making this with it. Yum! I saw the white whole wheat at the store (even Kroger's stocking 'alternatives' now), but wasn't sure it was worth the extra price because it isn't quick bread season for me. I crave fruit-filled muffins in summer and fall, but not really in winter...when fresh berries are back in season I may give it a try! Psssstt....wanna hear another secret? SOFT white wheat flour is also known as PASTRY flour, which is excellent for cakes, soft cookies, etc. What a way to sneak wheat goodness into baked goods! Thanks Nicole! I have eleventy five quick bread recipes I want to try, maybe this will health it up a bit. I've never heard of white whole wheat flour. I find that whole wheat flour always makes baked goods more dense than white flour. Maybe this white whole wheat flour is a happy medium. Love that it has the nutritional benefits of whole wheat flour. Was VERY happy to discover that Trader Joe's now carries their own brand of white whole wheat flour, as it was a good bit cheaper than King Arthur (although I still buy KA in a heartbeat if that's all that's available). Regular whole wheat still has a place in my pantry, but it is now used more as a 'specialty' ingredient, like wheat germ. Will definitely try the muffin recipe from Elise per your suggestion.And I love using white whole wheat in regular bread recipes, so don't be afraid, bakers! Try it half and half with bread flour if you're a virgin in whole grain territory. I had now idea you could sub white whole wheat for all-purpose! I'm definitely going to have to start subbing. Your muffins look amazing! A teaspoon of vital wheat gluten to a batch of whatever your making should make it rise a little better and not be so dense. If you find yourself wondering what to do with the rest of the wheat gluten there are some interesting recipes to make meat substitutes with it on the vegan sites. I know, why would anyone want a substitute for meat. My daughter is a vegetarian so I thought I might give it a try. Hi! just came across your site recently! its fantastic!! ive switched to white whole wheat when baking muffins as i do find reg. whole wheat much too dense and often leaves me with a very heavy muffin! Those look so good and thank you for the flour lesson. Always great to have more cooking knowledge. I recently used King Arthur flour in a whole wheat recipe and I really liked it. Perfect timing! I snagged some blueberries at Vons today JUST for the purpose of making muffins. Now I won't have to search for a recipe! Oh this is fantastic if i find any at a store near us....and what a fantastic looking muffin-bet its flavours treat the taste buds even better!!! I've used the King Arthur White Whole Wheat Flour before -- thankfully, I can get it locally at ONE grocery store in town -- and I think it is so great. We use whole wheat flour almost exclusively, but the white whole wheat flour was a new thing.I've tried it in my no-knead bread recipe and found that it works well (I like experimenting with different flours in that super-simple but very delicious recipe), but I bet it would work even better with a teaspoon of vital wheat gluten in it, as Michael suggested. I have used both regular whole wheat and the white whole wheat in differing amounts with plain bleached flour and KA's bread flour. Always interesting!Thanks for the lesson, because now I'll try it in quick breads, too! @Frieda - pastry flour is not the same as White Whole Wheat, the subject here. Pastry flour usually has been sifted to remove the bran and germ, just like all-purpose, though now you can get Whole Wheat Pastry Flour at Whole Foods. In the US, the term pastry flour designates flour with 7.5-9.5% gluten, while all-purpose has 9.5-11.5% gluten ("cake flour" has 6-7% gluten). White Whole Wheat is really a 'bread' flour, with gluten above 11.5%, though as a Soft White Wheat it does have lower gluten than the Hard Red and other wheats used to make up traditional whole wheat flours. (Source: page 29, Bread Bakers Apprentice") Obviously it can be used in other ways, just as traditional whole wheat can, with adjustments based on your tastes and preferences.One way to overcome the "less rise" issue would be to let the flour soak in the wet ingredients for a while, before adding the leavening, to let the gluten begin softening. Adding even more gluten would probably not help though it's a good addition if you substitute White Whole Wheat in a traditional Whole Wheat yeast bread recipe. In this case, adding a little bit more leavening would help, as would the soak. It looks like Blueberry. My Favorite!! I bought white whole wheat flour and then didn't know what to do with it! So glad I found this post.. I will make muffins and see what happens. Hope they turn out looking as yummy as yours look! Actually bought some King Arthur whole wheat flour yesterday to try a fig muffin recipe I saw. I must assume it's the same one of your other commentors mentioned. Haven't made them yet, but I have all the ingredients. Can't wait. I used to make whole wheat bread, but haven't made it in years. I am so glad I saw this post....I like to eat whole wheat vs white flour whenever I can and to sub out for things I make for my family but in certain recipes it just doesn't work as well. But I will definitely try this alternative. thanks! The butter on the muffin picture is the best! I like it! Thanks for the links! Ummmm, blue berries... love them. I've never tried white whole wheat flour, but I think I'd like to start. Do you use it entirely to replace regular white flour? Wow, those look amazing! Thanks for the tip on the white whole wheat flour. I will give it a try! I'm so glad that you explained how this flour works. I have a bag of it, but have hesitated in deciding how to use it. Muffins are a great start! I chuckled at how you mentioned these had been on your hard drive for months. I'm dusting off recipes I've photographed, but haven't gotten around to posting. These do look amazing. I use whole wheat flour often in my baking - most of the time the APF is replaced by this fiber rich grain. I sometimes add bran and germ too making it completely nutritious since I find some companies grind the whole wheat a little too fine. I totally agree with you - Wheat flour - Delicious! I, too, love the white whole wheat flour. I've been using it in place of all-purpose for everything the past three years, especially breads. The only downside is that, in pastries, I occasionally wish I'd used a bit less. They can be pretty dense. As a solution, I now go light on the muffin and scone mixes, just on the scant side of full cups while measuring, and I think family favorites still turn out perfectly and even more full-flavored. That's a great looking blueberry muffin, for certain! I loved your blog title because I actually Googled it yesterday. I have a recipe I want to try and it calls for white whole wheat flour. I hadn't a clue what that was. Both your explanations were excellent. I have whole wheat, but not white whole wheat. I'll have to make a trip to Whole Foods as this is a muffin recipe. I came to the same conclusion too after buying this flour a while back; those muffins look so tantalizing with that nice gob of butter! Finally someone is not afraid to eat butter! What a lovely blog you have here! Beautiful pictures and really tasty recipies. I'm on a mission to find answers about "pine mouth". One of my searches on google hit your blog :-) I hope it is ok with you if I'll make a link to your post about pine mouth? Unfortunately I write in Swedish though, so you might not understand what I write about (mostley vegetarian food thouhg). My readers fortunately know English.I'll definitely come back here and try some of your goodies! But for now, with this awful taste in my mouth, I wont do any great or special things in my kithcen. Hey Nicole! Great post, really informative. I accidentally bought a bag of king arthur white whole wheat flour, and have been experimenting with it in all my baking recipes. The most successful was a batch of pistachio cookies (I did half whole wheat, half all-purpose), which I felt was really complimented by the nutty white whole wheat flour. I love sneaking www flour into things when my kids aren't looking. =) I almost always use at least a little in place of some AP or bread flour in whatever I'm baking. Your muffins look wonderful! 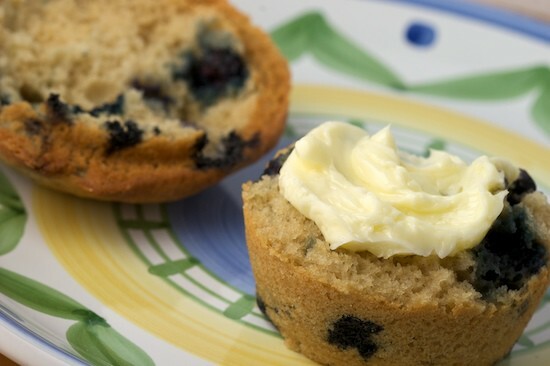 Aw, you eat muffins just like I love them: with an unabashed slab of butter. Looks delish! This is a great recipe!!! I would love to add it to our website (click on purelyfit above) We also have great articles and low fat burning recipes. I went out and bought some King Arthur's White Whole Wheat flour and made banana muffins following your recipe. We loved them! I hope you add more healthful recipes in the future. I will be checking back often!Thanks! I stumbled onto your blog while looking for a Red Velvet Cake recipe. I'm so excited you posted about this flour, because I just bought some a couple of weeks ago out of curiosity. I wondered what I should try with it, and now I know. Thanks! I have never made bread, and not sure I'm wanting to... However, I had a food sensitivity test done, and I am sensitive to gluten and whole wheat, but I can have white flour wheat. Are there products sold at Sunflower or Trader Joes that fit this category? it is very sweet and testy . i liked to me . thanks you.